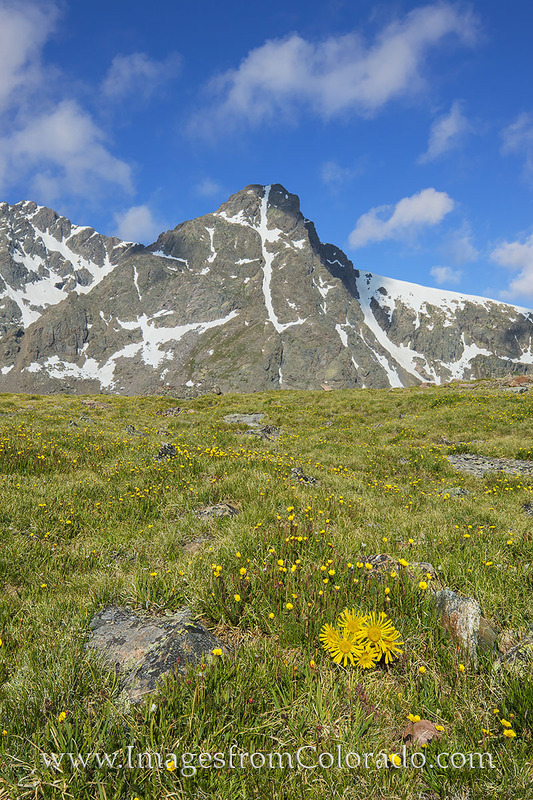 With the cross of Mount Holy Cross (14,005') etched in snow in the distant mountainside, beautiful and hearty Colorado wildflowers grow on the alpine tundra at around 13,100'. Seen here from the slopes of Notch Mountain, this Old Man of the Mountain (sunflower) adds color to one of the most iconic views in Colorado. First photographed in 1873, the snow cross on the mountain became a religious symbol, inspiring many to make the pilgrimage up to this point and witness the landscape for themselves. Photo © copyright by Rob Greebon.